Explorte Alto Garajonay in Vallehermoso, La Gomera. The Alto Garajonay is located on the central region of La Gomera in Vallehermoso, Canary Islands. 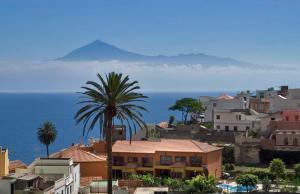 Alto Garajonay is the name given to the highest and most important mountain of La Gomera. This mountain as acquired great importance throughout History. Due to the importance of this mountain for the island inhabitants the name of the important Garajonay National Park was also attributed to the mountain. 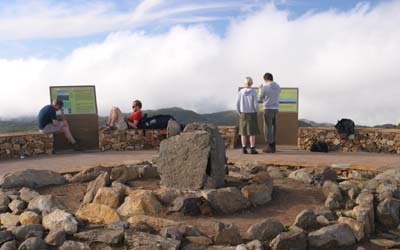 Formerly, this mountain was used for the practice of different sacrifices and ritual, as might be proved by the samples and evidences found on the top of Alto Garajonay. But this wasn’t its unique use, proofs also show that this mountain was used for the inhabitants to protect themselves from animals and different kinds of hazards. Another name given to Alto Garajonay was “El Bailadero” due to the fact that people believed this was a witches’ meeting place. For all this reasons we might say that this is one of the most quiet places to observe and contemplate the surrounding views. Thousands of people visit Alto Garajonay every year. If you’re visiting La Gomera don’t miss your trip to this site. To climb to the top you might wish to rent a car or take one of the many trails from which you’ll be able to enjoy sightseeing. No matter which is your choice we’re sure that you’ll be impressed by the amazing sceneries that can be sighted from this place. From the top you’ll be able to see a panoramic view of all the La Gomera island as well as distinguishing Tenerife, La Palma and El Hierro. If the sky’s clear you might even spot Gran Canaria. Parque Natural de Garajonay, Vallehermoso, La Gomera.